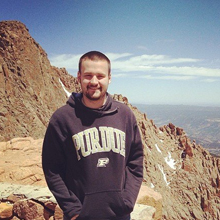 My name is Joe, and I’m a West Lafayette based Web Developer. I graduated from Purdue University with a bachelor’s degree in computer graphics technology. In addition to programing for the web, I create graphics for both the web and for print. I enjoy exploring the inspiration and mechanics behind sites with intricate designs, useful functionality, beautiful typefaces, vibrant images and even funny cat videos. The Internet, provides an effective vehicle for my drive to create, learn and help others do the same. This drive shaped my goal to become a web development project manager. In working toward this goal, I have, in addition to my technical and programming prowess, developed an effective knowledge of how I learn best, a strong desire to continue learning, perseverance in solving complex problems, and an ability to implement elegant solutions. I am passionate about User Experience because it is easy to engage in what I like to call “selfish design”—that is, making design decisions without giving thought to how we are communicating with our users. It does not matter how good an interface looks; if a person’s interaction is inefficient and unhelpful, we, as developers, are failing to communicate well. I love the idea of using user feedback to refine my projects. When that idea became the foundation for my work; I started to design with the user in mind. In my senior capstone course, I researched and created a user experience that would elicit emotions like compassion, and anger. The idea was that these emotions, given a proper release, would shape a user’s behavior. I would love to learn other ways of eliciting emotion and shaping behavior while developing my project management skills, especially if that means diving into disciplines like art, cognitive psychology, and marketing.